Kirsten Cappy of Curious City is serving as the Project Director for I’m Your Neighbor, Portland. Cappy’s company envisions the role a children’s book can play in communities and in education and then creates tools and programs to help that book’s mission. 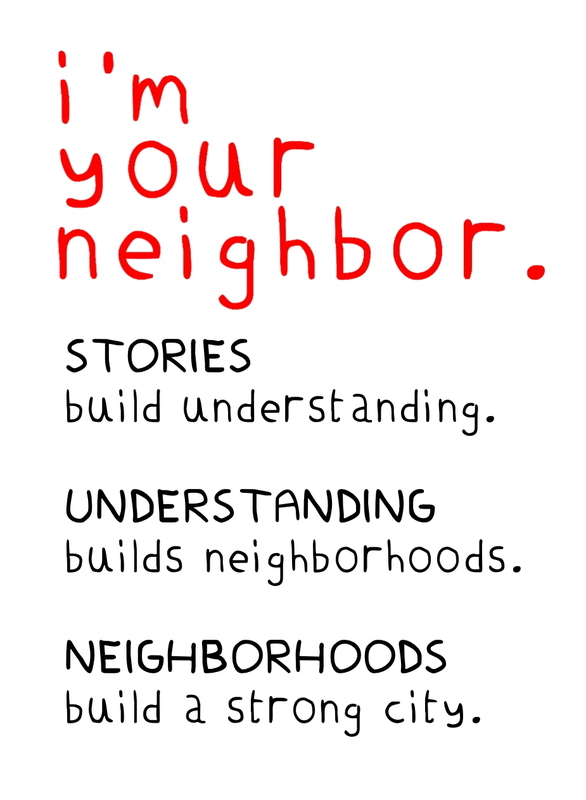 She envisioned I’m Your Neighbor, Portland with many of the authors of the Featured Books as a way to create dialog around cultural commonalities and curiosity about cultural differences. Cappy ran a week-long seminar on Portland’s experience with immigration for the University of Delaware from 2008-2011. Contact Kirsten or call 207-420-1126. Delanie Honda is an English major at Wheaton College in Norton, MA. Her involvement with I’m Your Neighbor, Portland began last summer as intern with Kirsten and Curious City. She worked on content for the I’m Your Neighbor Books website and the early planning stages of I’m Your Neighbor, Portland. Contact Delanie. Dr. Krista Maywalt Aronson PHD is an associate professor of Psychology at Bates College. Professor Aronson is broadly interested in how people come to understand complex social constructs like race and how this understanding influences interpersonal interaction and psychological wellbeing. Her current work is focused in three areas: effective interventions for enhancing intercultural relationships during childhood, adolescence and adulthood, the dynamic nature of acculturation and the ways in which Somali and Non-Somali Mainers experience immigration during childhood and adulthood. The Portland Public Library is serving as both the fiscal sponsor, event host, and repository of community copies of the Featured Books in I’m Your Neighbor, Portland. Contact Library Executive Director, Stephen Podgajny. “The Library places a great emphasis on promoting a sense of community through reading and programs.” –The Portland Public Library Executive Director Steve Podgajny. Anne Sibley O’Brien is a children’s book writer and illustrator and a co-founder of “I’m Your Neighbor Books.” Her focus on diverse characters and cultures was sparked by her experience of growing up in South Korea as the daughter of medical missionaries. Two of her titles are included in the I’m Your Neighbor, Portland booklist: A Path of Stars, which she wrote and illustrated under commission from the Maine Humanities Council and in collaboration with members of Maine’s Cambodian community; and Moon Watchers: Shirin’s Ramadan Miracle by Reza Jalali, which she illustrated. She lives on Peaks Island, and blogs on race, culture and children’s books at “Coloring Between the Lines.” Contact Anne. Reza Jalali, a Kurd from Iran, is one of the contributing writers to Child Labor: A Global View (Greenwood Press), the multimedia production Middle East Suitcase Project (Center for Cultural Exchange), and The World of Child Labor: An Historical and Regional Survey (M.E. Sharpe Inc.) Jalali wrote the foreword to the I’m Your Neighbor, Portland Featured Book, New Mainers (Tilbury House Publishers) a book on immigrant’s experiences in Maine. His first children book, the I’m Your Neighbor, Portland Featured Book, Moon Watchers (Tilbury House Publishers), has received a Skipping Stones Honor Award for Multicultural Book. His play, “The Poets and the Assassin”, which is about women in Iran has been staged at Bates College, University of Southern Maine, Bowdoin College, and University of New England. Jalali currently serves as the Coordinator of Multicultural Student Affairs at the University of Southern Maine. Terry Farish is the author of The Good Braider, a novel set in South Sudan and Portland, Maine. It is the winner of this year’s Lupine Award for a young adult book and is an ALA Best Book for Young Adults. She leads book discussions for English language learners and worked with Nepali-speaking people from Bhutan to produce a bilingual Bhutanese folktale, The Story of a Pumpkin, published by the New Hampshire Humanities Council. Jon Hinck is an attorney in private practice concentrating on pro-consumer litigation. He recently served three terms in the Maine House of Representatives, representing residents of the City of Portland. In the legislature, Hinck sponsored and helped gain passage of important energy, environmental and civil liberties legislation. Prior to moving to Maine, Hinck was Acting Attorney General for the Republic of Palau and help enable the Pacific island state to gain its sovereignty in 1994. Hinck spent a decade working with the worldwide environmental organization Greenpeace and was a co-founder of Greenpeace USA. He has a BA from the University of Pennsylvania and a JD from the University of California Berkeley. Contact Jon. Catherine M. Anderson has been a public middle school language arts teacher in Portland for fourteen years, and is the Co-Chair of the Cross Cultural Committee at her sons elementary school, where she co-organized a very successful pilot of the I’m Your Neighbor program three times this year. Both parenting and teaching children of color awakened her to her work as an anti racist ally and training facilitator for educators and professionals. She has presented at her workshop on talking about race in and out of the classroom at USM, the MEA Conference, and for the Portland Public Schools. She is also a published poet, essayist and blogger. Elizabeth Miller is educator from Portland Adult Education and will serve as the I’m Your Neighbor, Portland evaluator.